UPDATE: I should totally have mentioned -- this is my 100th post on Hungry Sam! More on that next time, of course. As it will be the year 5772 in just a few hours, I'll be celebrating with friends tomorrow evening at a Rosh Hashana potluck hosted by my friends Rebecca and Rachel. Yeah, so we're Jewish. 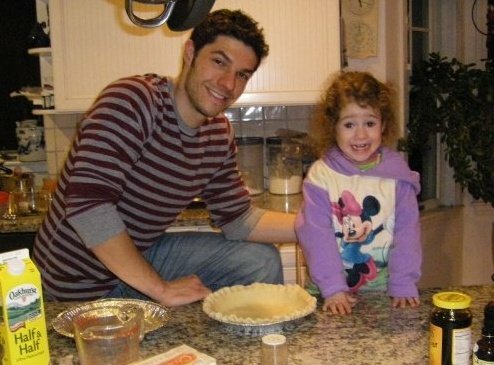 Anyways, though not a traditional RH dish (I don't know if they HAVE pumpkins in the Holy Land), I've got a wicked hankering for pumpkin pie -- so that's what I'm making. 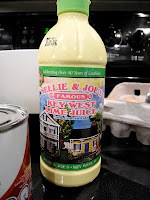 I'm torn, however, between my mom's recipe (which uses half &half) and two other techniques (one which uses cream cheese, the other sweetened condensed milk). Any advice, Hungry Sam readers? 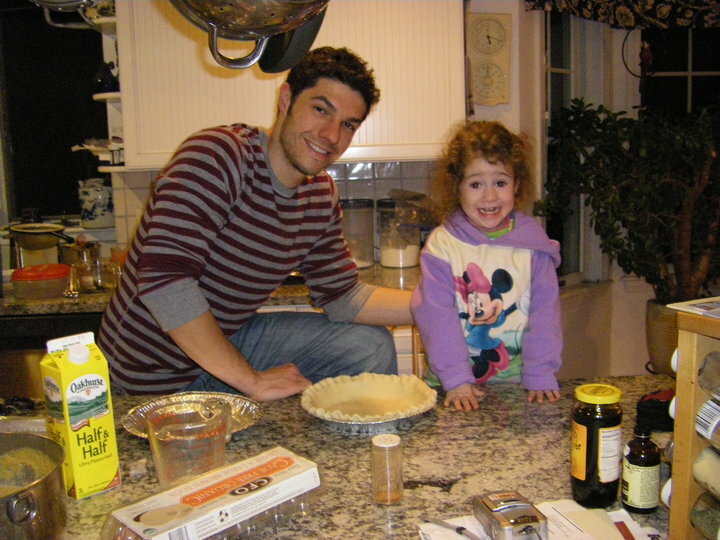 Finally, I leave you with this picture of my adorable cousin and me making pumpkin pies a few years ago. Shana tova, may you be inscribed in the book of life for a happy, healthy, and food-filled new year! Millions of Peaches, Peaches for Free! 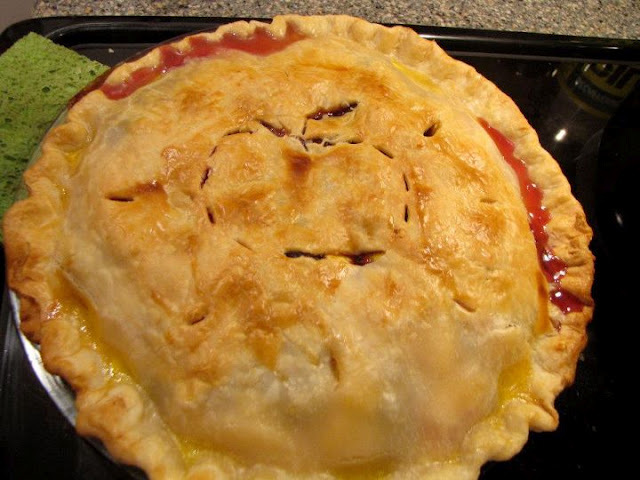 This peach pie has a peachy sort of shape cut into the crust (Jen's idea, not mine)! Also, I put this peach pie picture up first because I know how many people are inclined to click on a picture of a pie, if presented with one. Now you're trapped and sliiiightly more likely to read this post! Hungry Sam blogging advice. Write it down, kids. I even kind of made it look pretty. Ok. Unless you're a masochist who enjoys spending several years squeezing tiny little Key limes, this pie is definitely the easiest pie, and perhaps the easiest dessert, evah. Which is how we like to say "ever" whenever we're excited the Red Sox decided NOT to spend July and August dropping to the bottom of the AL East! But I digress. Note my awesome super old hand mixer. Important detail: You can't just use regular lime juice. Key limes are significantly tarter and possess a greater depth of flavor -- they almost taste more like a wicked tart berry than a citrus. They're very, very small, about an inch in diameter, and you can sometimes find them in small sacks in the produce section. 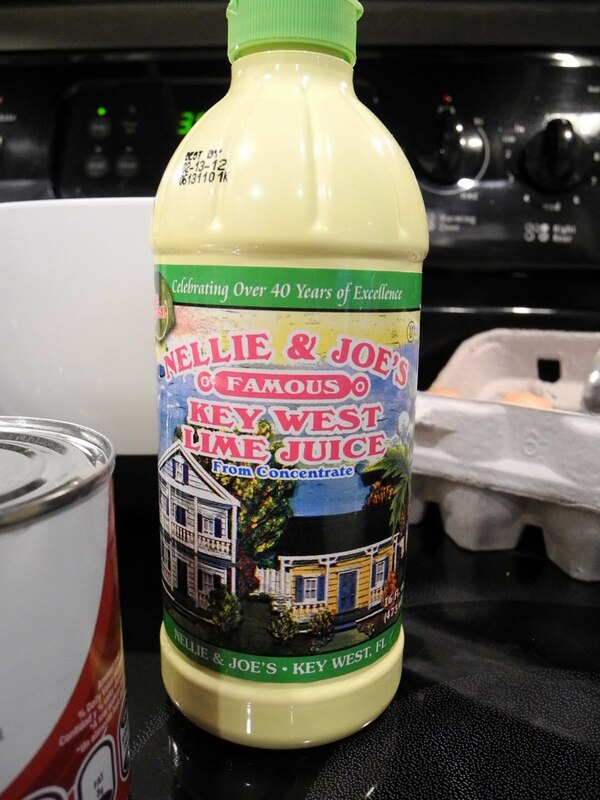 Each lime contains only a scant amount of juice; however, my Grammy turned me on to Kellie and Joe's Famous Key West Lime Juice and I haven't looked back since. I've seen it sold everywhere form a standard supermarket to the neighborhood bodega, so look around. Actually making the pie is simple. Preheat your oven to 350 degrees. Using an electric beater (mine's from like 1976, if you can't tell) or a whisk, or a fork (but come on, spring for a whisk), beat together three egg yolks, the milk, and 1/2 cup of the juice. Then, pour it into the crust. BAM. That's it. If you don't know how to separate egg yolks from their whites, here's a helpful video explanation. Now if you want to be fancy (happy, Dawn and Rachel? ), paint the exposed edges of the crust with the egg whites you've separated out -- it gives the crust a nice sheen and will help prevent it from breaking into crumbs when you try to cut the final product. That's an el cheapo silicon brush, but fingers work too! Finally, if you're decorating, thinly slice a halved lime and arrange on the pie. I threw a blackberry into the center, because we had some and I like blackberries, which is the reasoning that guides many of my cooking decisions. I think it's best to let it cool fully and to refrigerate the pie before serving, but that's your journey. The pie keeps reasonably well for maybe five or six days in the fridge.